Yes, I’m including a doggie portrait in my ongoing ode to the portrait. Whether a dog, cat, bird, squirrel, ermine, or fish, animals have been part of portraiture in western art since the revival in importance of portraiture during the Renaissance (c1400-1600). Pets and favorite animals have also been popular in the art of many Asian cultures, as well as in Islamic lands. In the 18th century, it was very fashionable in England for people to have portraits painted of their favorite horse, so, yes, I feel totally justified in including this adorable doggie in my “ode to the portrait.” And what better artist to use as an example of the genre than the superlative animal painter, Rosa Bonheur? Painting in France in the 1830s and 1840s gradually shifted from an emphasis on the exotic and dramatic of Romanticism to an emphasis on extreme naturalism based on acute observation of nature. Whereas Romanticism relied on naturalistic detail in order to tell a dramatic story, Realism used naturalistic detail to depict everyday life without dramatic or romantic overtones. The popularity of Realism paralleled the rise in prosperity all over Europe of the middle-class. As a new class of art patrons, they rejected history painting in favor of scenes recognizable from their own lives. 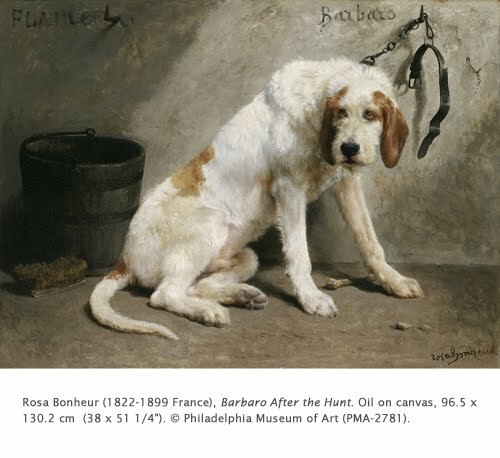 Rosa Bonheur was initially trained by her father Raymond, a realist landscape painter. She furthered her painting skill by going to the Louvre routinely in her teens and painting copies of great masterpieces. She was particularly interested in the realism of Dutch Baroque painters. Her eye for detail and meticulous realism were already apparent, and she was able to supplement her family’s income by selling these faithful copies. At seventeen she became interested in painting scenes of animals. Horse fairs, cattle markets and domesticated pets were her study material. She also visited slaughter houses to learn the underlying anatomy of the animals she painted. From her teen years on, Bonheur spurned society’s conventions in many ways, including a preference for wearing pants (for which she had to get written permission from the police) and her hair short. She showed paintings every year at the annual Salon sponsored by the French Academy in Paris starting in 1841. Her biggest triumph was “The Horse Fair” exhibited in the Salon of 1853. It was the most talked-about work of that year and was exhibited in England. From that time on she was an internationally acclaimed artist. The hound Barbaro sits next to the wooden bucket and brush with which he has just been scrubbed following a day of hunting. Barbaro was one of the many animals Bonheur kept at the Chateau de By, near the forest of Fontainebleau, which she bought in 1859 as a studio, and which today is a museum dedicated to her art. A typical aspect of her paintings is that she filled her scenes with ambient light. In this one, the light streams in from an unseen door. Although she studied light and atmosphere carefully, she did not adopt the ideas of impressionism, but worked in a traditional yellow-brown-green landscape palette. To my point of view this is what I call a perfect article! Do you utilize this blog for private joy solely or you actually have it to get profit with its help?